They are so near the bubble in the $2k NL event — 102 players left. Tulsa is sitting comfortably below average with about 32k in chips (avg. is 50something). He’s playing so tight it’s sick. Little veins quietly pulsating on his bald dome. I just got chased out of the playing area for the first time — something about that 13-table rule. Though I question its validity, I chose not to make a stink of it at this time and retreated. Will leave the shooting-your-face-to-spite-your-nose to Gonz. UPDATE: The bubble has burst, and Eric Celeste (Tulsa) has survived. 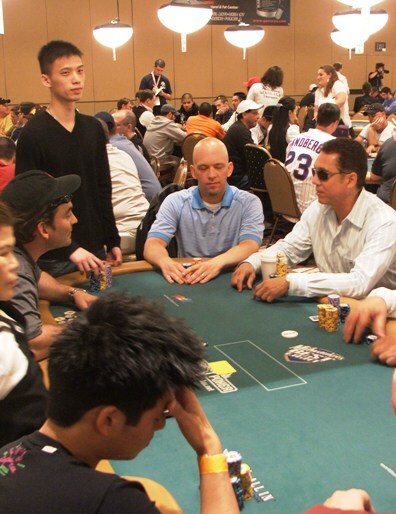 So has Brasilian media sweetheart Miradu … who was down to 1.5 big blinds. Meanwhile, Darling has very few chips left on the 10/25 PLO cash table … not because he is losing, but because he has pretty much only stacks of 100s in front of him. 30ish k, it seems. UPDATE: Tulsa has pooed and feels much better. He’s guaranteed a net +$3,381. Final table would be about $45k, and the winner will bank half a mil. Does Eric have cards in that pic? He sits like I do with his hands out and I have learned that dealers hate that. They usually can’t tell if I have cards and try to skip by me.